Robert Stieglitz beats Isaac Ekpo on points to retain his WBO super-middleweight title in Leipzig on Saturday night. The German veteran won by 118-110 on two cards and by 119-109 on the third as his Nigerian opponent struggled to land scoring blows. Stieglitz, improving his record to 46-3, including 26 knockouts, outclassed Ekpo throughout the bout. The challenger left the ring with a record of 22-2, with 16 knockouts. The 30-year-old Ekpo represented Nigeria at the 2004 Athens Olympics but had not beaten any leading contender on his way to being rated seventh by the WBO. Stieglitz was making the second defence of the title he regained in March this year when he stopped Arthur Abraham in the fourth round. In July he cruised to a one-sided stoppage victory over Yuzo Kiyoto. As was expected, he simply had too much experience and skills for Ekpo. SAPA-AFP reports that Stieglitz admitted after the bout that he had laboured to retain his title. "The main thing is that I am still the champion," he said. "I imagined the fight would have gone a bit better; I wanted to show more." His 46th victory in his 49th professional fight was far from a spectacle for the 6 000 spectators. Ekpo made the champion German work for the victory. "He was very mobile and kept dipping down. 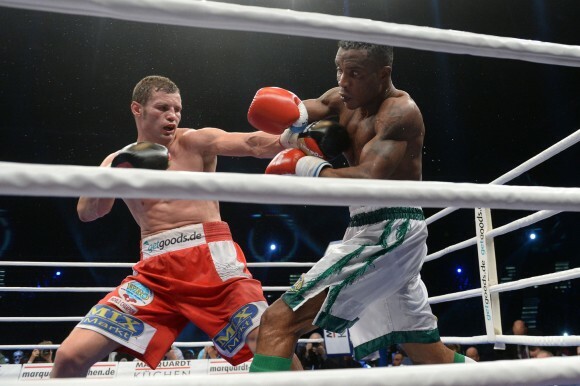 He was hard to box against," said the 32-year-old Stieglitz. He is now likely to take on a third bout against Arthur Abraham or fight former WBA middleweight champion Felix Sturm. On the undercard, Manuel Charr beat Denis Mahktov in a heavyweight bout. Haktov injured his right hand and the fight was stopped just after the start of the sixth round, enabling Charr to move his record to 25-1, with 15 knockouts. Bakhtov’s dropped to 36-9; 24. Jan Zaveck, a former IBF champion, beat Sebastian Allais over eight rounds in a welterweight bout, improving to 33-3; 18. Allais dropped to 15-8-4; 5. Germany's Robert Stieglitz admitted he laboured to defend his world super-middleweight title with a unanimous points win against Nigeria's Isaac Ekpo. Stieglitz was made to work in Leipzig against African champion Ekpo with the judges awarding the fight 110-118, 110-118, 109-119 to the WBO champion on Saturday night. "The main thing is that I am still the world champion," said Stieglitz, after his second defence after winning the title from compatriot Arthur Abraham in March. "I had imagined the fight would have gone a bit better, I wanted to show more." This was Stieglitz's 46th win in his 49th fight, but was far from a spectacle for the 6,000 crowd and Ekpo, 30, made him work hard for the victory. "He was very mobile and kept dipping down, he was hard to box against," said the 32-year-old Stieglitz. Next up for Stieglitz is a third bout against Abraham or ex-middleweight WBA champion Felix Sturm, said his management.